If you’re a trekker or a mountaineer, than Baltistan is pretty much where it’s at. Nothing can belittle the charm of Hunza and Nagar, and trekking around Nanga Parbat is awe-inspiring whichever side you approach that mythical peak from. But there’s something special about Baltistan that I haven’t found elsewhere. However, do remember that Baltistan lacks the greenery and pristine alpine scenery that you may find in places like Hunza , Nagar or Naltar. If the purpose of your visit is not to trek (or climb) than you are probably better off sticking to other places. Baltistan is the poorest area we have traveled to in the Northern Areas and this poverty is reflected in the extremely destitute lifestyles of most Balti people. Yet despite of crippling poverty, Baltis are perhaps the warmest people we have come across in all of the Northern Areas and their level of professionalism as porters puts all others to shame. Skurdu, the capital of Baltistan is a relatively unclean outpost in the middle of the Karakorams, and while not quite as conservative as Gilgit–Getting there and away , the town lacks the laid-back charm of the Hunza valley. The mountain views from Skurdu are not particularly spectacular either – for that you would have to get out into the mountains. If your purpose is simply sightseeing from the towns you may end up being disappointed. This is our guide for the town of Skurdu. 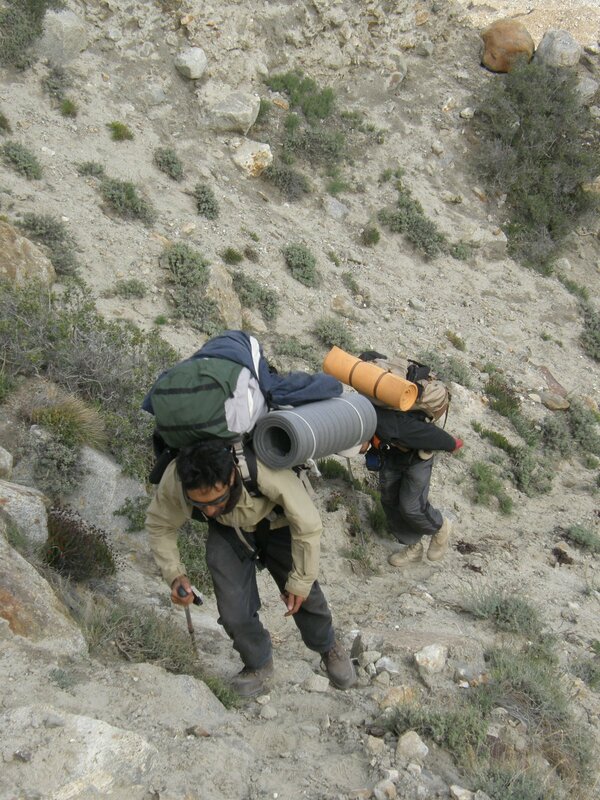 For resources on trekking, check out the Baltistan trekking resource page. Note: Skurdu lies close to the border with India and is home to a large army cantonment from where troops posted along the line of control are supplied. Before entering Skurdu, domestic visitors are required to present their National Identity Cards and sign in with the military check-post 30 kilometers prior to the town. Likewise, foreigners would be expected to show proper travel documents. Do not attempt to enter Baltistan without proper documentation, as at the very least you may be delayed, and could possibly be turned back as well. During times of heightened conflicts with India, such as during the Kargil War of 1999, curfew is also imposed in the city. If you decide to go out for a post-dinner walk you may find the town surprisingly deserted even early on in the evening. In theory, the most convenient way to reach Skurdu is to fly in. The one-hour flight leaves daily from Islamabad and costs Rs. 1,400/- for Pakistani nationals. Flights to the region are subsidized by the government and it seems like a great deal especially considering that the other option, road travel, usually ends up taking close to 24 hours. The catch, however, is that flights are subject to weather conditions en route which means that most of the flights end up getting cancelled especially in the summer months. On the next available flight, priority is given to people whose flight got cancelled previously, and combined with the bull-in-a-china-shop chaos down at the Northern Areas Booking Office the entire thing just ends up turning into a painful ordeal that makes the otherwise nerve-shattering road journey seem blissful by comparison. This leaves road travel as the only “reliable” alternative. A few buses like Masherbrum Travels’ leave from Rawalpindi’s Bir Badaai(n) bus “terminal” and make a twenty four hour run (road conditions permitting) straight to Skurdu in buses packed to the roof and beyond. But unless you’re a hardened traveler – and we feel no shame in admitting we’re not that hardened – don’t even think about it. Travel to Gilgit–Getting there and away from Islamabad (approximately fifteen hours) and then catch a bus to Skurdu. Amongst other things, this will give you a chance to stretch your legs, have a meal, or restock on the tranquilizers. For road options on getting to Gilgit–Getting there and away , refer to our page on Gilgit–Getting there and away and the Karakoram Highway. Shahrae Skurdu follows the Indus to the capital of Baltistan branching off an hour or so off the Karakoram Highway before Gilgit–Getting there and away . The journey takes six hours including a traditional 15-minute break for tea at the halfway point. The road is considerably more winding (read: dangerous) than the Karakoram Highway. For this reason all buses and vans to Skurdu from Gilgit–Getting there and away and vice versa leave either in the morning or early in the afternoon. Save for a few trucks and jeeps the road is deserted after dark. As of the summer of 2001 there were three companies running vehicles on this route. These were K2 , Masherbrum , and the government run transport company, NATCO . All are equally traumatic, but our pick from the above three would be NATCO. There is no logical reasoning behind this except for the fact that the last time we traveled on this route we traveled “relatively” comfortably whereas passengers in K2 and Masherbrum were stuffed like cattle (we admit that maybe we were just plain lucky). In Gilgit–Getting there and away , vehicles leave from the NLI Chowk in the center of the town and the ride costs Rs. 150/-. Simply head on down there and hop onto the first vehicle heading to Skurdu. In Skurdu, the vehicles will either drop you off at Yadgar Chowk or Husaini Chowk , both central locations. A private van from Skurdu to Gilgit–Getting there and away will cost Rs. 2000/-. For a small town, Skurdu offers a lot of places to stay because of the thousands of trekkers and mountaineers that pass through the town every summer. Hotels abound near Yadgar Chowk where you can just walk from one place to another and find some place that fits your taste and budget. These places are generally inexpensive (estimate Rs. 100/- to Rs. 150/- per person/per night and be sure to bargain politely). However these hotels suffer from being bang in the middle of the town. You can do slightly better by walking ten minutes past Yadgar Chowk to reach Indus Motel where we have been staying for the last two years. Indus Motel is not a terribly exciting place, but the Manager, Ghulam , can be very helpful if he wants to. Moreover, Indus Motel caters to mountaineers and trekkers so they’ll not only be able to accommodate you and a few tones of gear, but can also offer useful suggestions about hiring jeeps, porters, and sirdars. Most of the rooms lack windows, and the washrooms are basic, but all in all its not a bad place to stay and not expensive either. The two other hotels that are often frequented by mountaineers and trekkers are the Concordia Motel and the PTDC’s K2 Motel . Both are considerably more expensive, especially K2 Motel that will run you back around Rs. 1,000/- per night. They do have a lovely garden with a great view of the Indus, a secluded location, and plenty of storage space for expedition equipment. Still, that’s way too expensive for us. We have no first hand knowledge of Concordia Motel, though by the sounds of it, it is certainly worth checking out one of these years. There are probably a few dozen places to stay in Skurdu and finding a place, even bang in the middle of summer, should not be a problem. If you’re off trekking or climbing it helps to stay with a place that frequently house expeditions, though in a pinch any place should do. Rich Pakistanis go and stay at the infamous Shangrila about twenty minutes out of the city. Supposedly very expensive and boasting things like pagodas, red tiles on the roofs and rowing boats, it hardly seems like something you’d expect to find in Baltistan. Avoid it unless you have a particular fancy for these sorts of things. Here’s the deal – your hotel and every other will try and force all sorts of delicacies onto you, ranging from Peking Duck to Salmon Lasagna. Ignore them all and walk down to Yadgar Chowk. Look for a run-down place called Pashtoon Khwa Hotel and just waltz right in. You’re now in chapali kabab heaven. Whether for breakfast, lunch or dinner there’s no finer food to be had in the world than chapali kababs. And while cynics may insist that you get better ones in the Frontier province, well tough, you’re in Baltistan now. Depending on hungry you are, start out by ordering between five to ten per head. Ignore the stares you get from local people and chow down till you can’t eat no more and the stale, smelly air of Skurdu makes you sick, and you spend the next two days throwing up in your hotel room. Because one day when it’s all over and your 10,000 miles away from those kababs your going to look back and wistfully ask yourself why you didn’t eat that last lousy morsel. Once you’re done stroll across the street to the general store and buy yourself an Rs 3/- ice cream cone. Have two or three while you’re at it. If you’re on a budget, a shop down the road towards Husaini Chowk sells them for Rs. 2/-. You can’t beat that. Should you choose to ignore our culinary suggestions, any place will serve you standard fare. What’s the point in coming to Baltistan though? Well it isn’t Disney Land but that doesn’t mean that you can’t enjoy Skurdu if you’re not a trekker. The most highly recommended day trip would be up to the Deosai Plateau. At 14,000 feet Deosai is the highest plateau in the world, carpeted in flowers from July onwards. 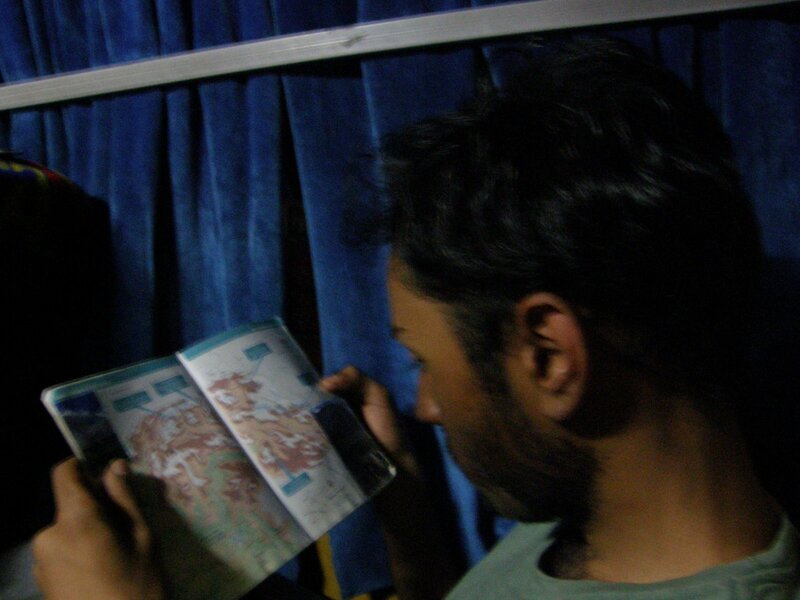 On information on how to get there check out our Deosai resource guide. On route to Deosai , and maybe ten kilometers from Skurdu, you’ll pass by the Satpara Lake . The lake is actually a pretty big one (unlike most lakes in the Northern Areas that most of the time just turn out to be ponds), and on a cloudy day the colors are awesome. It’s not a bad place to go hang out for an afternoon, and a small shack there sells tea and snacks. There’s plenty of room to walk around though remember that a few kilometers above you’ll have to clear a security post for the Deosai Plateau and prove your not an Indian spy. The Skurdu Fort perched above the Indus and clearly visible from the city is worth visiting especially at sunset. The views of the valley and the river are really quite impressive. It’s maybe a short 20-minute walk from the town center – just walk in the direction of the fort or keep asking for directions till you get there. Atop of the mountain is some sort of air force installation so just be careful in which direction you point your camera. Note that Baltistan’s numerous bridges are very photogenic but security personnel are paranoid about tourists photographing the bridges. Even if there doesn’t seem to be security around is rest assured that they are watching and they will confiscate the film in your camera if you photograph bridges or other military installations. In today’s day and age of satellite and other high-tech surveillance, these precautions all seem a bit daft, but that’s just the way it is. If your planning a trek please consult Skardu, Baltistan–And away of the Baltistan Resources that deal with procuring supplies, and hiring jeeps, guides and porters.